To have straight hair is a blessing from above. It has so many opportunities for styling, it looks wonderful on short, medium and long hair length. Although hair trends are changing each time, but straight hair always has some new fresh ideas for styling and is never out of fashion. If you have straight hair, I hope you are using all the benefits that such hair type can offer, if no, check out this post to find the most awesome ideas for straight hairstyles, and get inspired to have cute looks this summer. Long hairstyles with ponytails, fishtails and top knots are the most popular hairstyles for summer, I dare say, because they open up your face, neck, and tanned skin will be marvellously playing in the sun getting more seductive. Even for special events like weddings and proms, straight updo and downdo hairstyles are the trend. Super sleek looks shouldn't frighten you, cause at any moment you can tousle hair, or create a pompadour style if you like. Medium hairstyles are in trend as usual, for straight hair it's very nice to have midi haircut that accentuates facial features and puts accent on eyes. You can try asymmetric layers to get new experience and fun, and also choose symmetric haircuts that will frame your face and underline the perfect proportions. Center or side parting is totally your choice, both variants are in fashion now. Short hairstyles are absolutely amazing on straight hair. Imagine short pixie or cropped bob, it looks unique especially with razor layers. You can wear such hairstyles sleek or tousled and have great image. And now, ladies, let's have sneak peek at some examples of straight hairstyles. Look at her hair! So straight and glossy, you can easily confuse it with pure silk! The braided strand adds some glam to her silky image. Ponytail is an astounding hairstyle for straight hair. Especially this design on the photo with highlighted hair, and a bit raised roots and crown part, that makes the hairstyle very elegant. 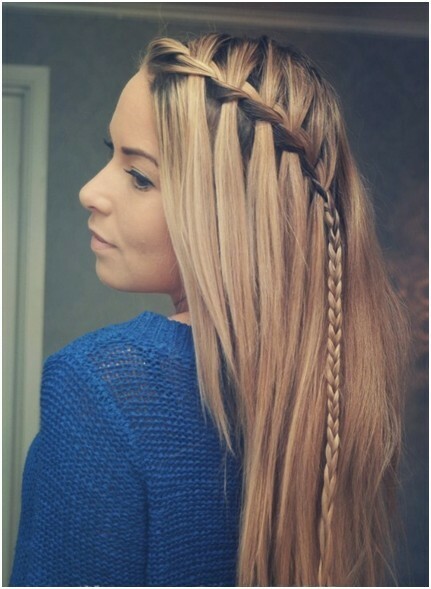 This cute blonde straight hair looks amazing styled a bit messy and the horizontal braid that seems to take the front strands off the face makes the image very cute. Flattering design for straight hair. Dark root and sandy blonde hair color result in a cutest diagonal braid that can be suitable not only for every day life, but for some special event as well. Short hairstyles and straight hair combined together make a breathtaking design.This spiky bob though has sharp edges all over the length, but it doesn't look aggressive at all. Sometimes straight hair if left loose all the time can seem boring, so don't dare to do it, cause even a simple twist ending in a side ponytail make it look awesome.